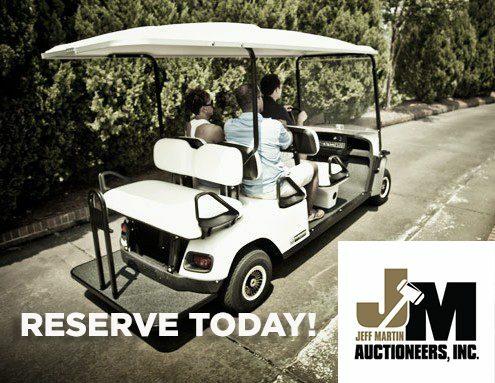 Need a Golf Cart for Jeff Martin Auctioneers Event? Address: 5000 Oren Brown Road, Kissimmee, FL 34746. All carts must be registered. This will be proven through Event permit sticker provided by Auction. The sticker must be affixed to approved cart. No refunds will be issued once reservation is placed. Cars must be returned by 5 PM of last day of reservation period to avoid a late charge. Mid Florida Golf Cars reserves the right to charge for cars that are not returned to Golf Car Compound after the rental term is concluded.